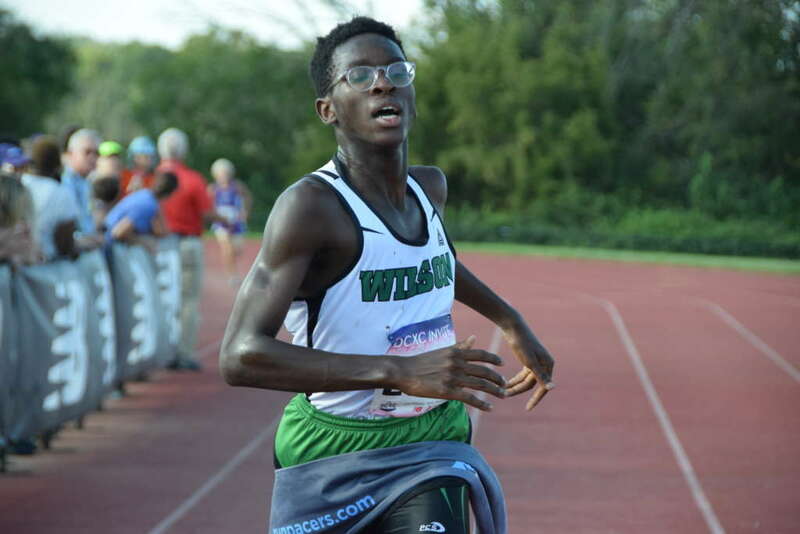 Woodrow Wilson sophomore Vincent Kamami spends a lot of his time before races wrapped up in his nerves. This week, coaches and race directors were right with him. As rain continued to fall on the D.C. area, the fates of weekend invitationals were once again in doubt. On Friday, Fauquier County, Va.’s Octoberfest Invitational pulled the plug, like Oatlands two weeks before and Maryland’s Track and Trail before that, driven by concerns about how courses would survive the onslaught of spikes and body weight. But the DCXC Invitational at Northeast D.C.’s Kenilworth Park was a go, and runners would have a chance to face off and get dirty. Coaches, and Kamani, could stop fretting and start planning on actually racing. The flat, usually fast course was not immune to the rain, and long muddy stretches and iffy turns forced many races to become tactical, which as T.S. Wootton senior John Riker remarked after his third place finish, would ultimately be more beneficial in the long term for runners. 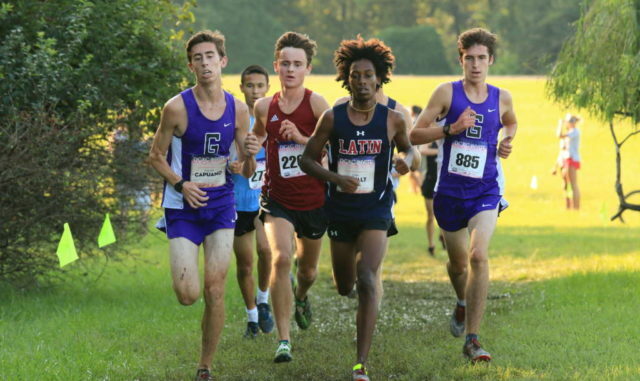 Although times didn’t match historical marks, the conditions treated spectators to treats that ranged from dominant performances in a few races and a finishing kick in the senior boys’ race that closed out the meet with a thrill. Local teams defended their turn against a fair number of visitors, and they only allowed one out-of-towner, Daniel O’Brien of the Virginia Episcopal School in Lynchburg, to snag an individual win, in the junior boys’ race. With many Northern Virginia teams betting on Octoberfest, Montgomery County, Md. teams swept the composite team scores, with Wooton taking first among boys (over Winston Churchill) and third for girls and four-time Maryland 4A champion Walter Johnson coming away with a win over rival Bethesda-Chevy Chase, which also finished third for the boys. 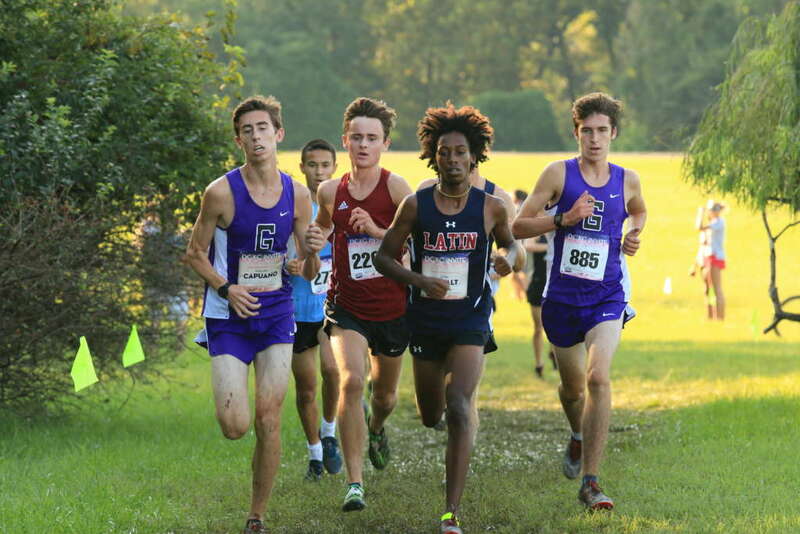 Visiting team Grafton, from the Tidewater, put boys in third place in the freshman, sophomore and junior races, many inspired following then-senior, now Georgetown freshman Price Owens’ win in 2017. The course follows two loops of Kenilworth Park, ending with a tight turn before the last 150 meters or so on an all-weather track. 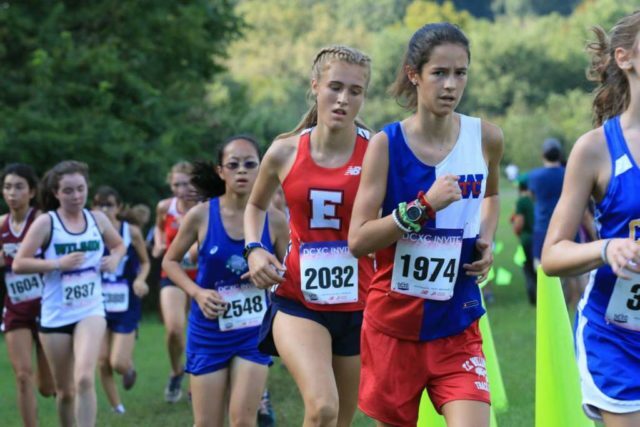 Eight varsity races divide runners into age classes, giving runners in grade a chance to race entirely against their peers. This was the fifth year for the DCXC Invitational, which Pacers Running envisioned to bring attention to Washington, D.C.’s running scene, which included only a few small cross country invitationals. If Bishop O’Connell’s girls plan to retake the Washington Catholic Athletic Conference title from St. John’s, freshman Katherine Slovak will likely play a big part. She outdistanced the rest of the freshman field to win in 20:41, 19 seconds ahead of Katherine Strong of Stone Ridge School of the Sacred Heart. Slovak held off early on, in hopes of running an even pace, and moved up throughout the race. She’s been running competitively since fifth grade. For Slovak, the freshman-only race might have been less crowded, but it would’t have changed her tactics to have older runners in the race. “Upperclassmen might have been ahead of me, but I wasn’t going to change how I ran,” she said. Strong took a lap of the course to survey the conditions. Grace Glade was hoping for a top-five finish, which she achieved by finishing third in 21:14. 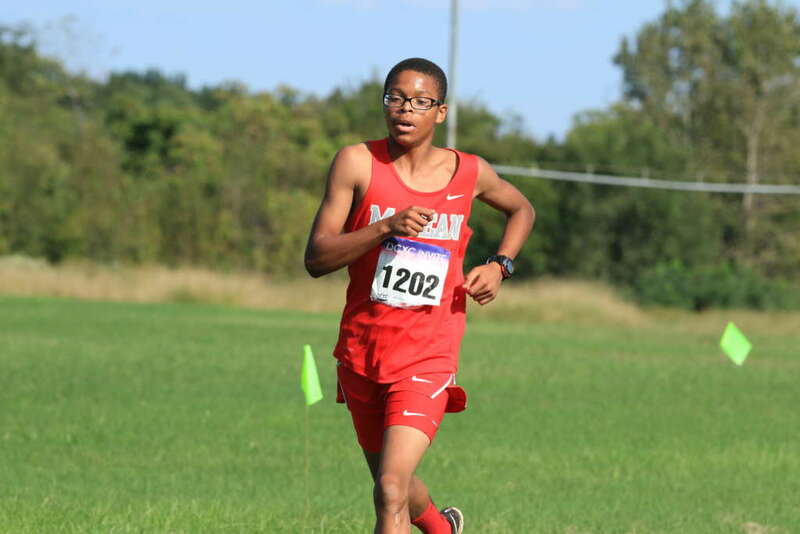 McLean’s Xavier Jemison tore through the finish line with enough momentum that the finish banner went with him, and after a few steps he figured he’d take it with him. Given the way he owned the rest of the race, he might as well have. Jemison didn’t mess around, taking off soon after the gun and laying waste to the rest of the field, winning in 17:25 with a 25-second margin over Gloucester’s Tanner Baker. “It’s slow for me, I was hoping to be under 16 minutes,” he said. He’s a recent transplant from Naperville, Ill. who is riding a three-race winning streak to start his freshman year, including the freshman race at the Monroe Parker Invitational. Jemison hurt his ankle stepping in a hole during the race, but still managed to finish the race strong. Baker and Ben Madrigal had a little more trouble with the mud, but keying off of each other helped pull them through. “I was wearing spikes, but that doesn’t really help if you can’t get them in solid ground,” Madrigal said. Washington Latin’s Zoe Edelman was exhausted after winning the sophomore girls’ race, which she won in 19:51. The afternoon heat – Edelman is not used to running in the middle of the day – got to her at times, but it didn’t distract from her pre-race mental preparations. “I told myself I was going to run my best race, even with the mud,” she said. Piper Dean hug onto her for most of the race before fading to second in 20:11, but while she was frustrated to have lost after making a bid for the lead, she struggled to find a performance that was any better. Tess Brinkman is finishing up her first month or so of training, after taking the summer off to recover from tendinitis in her hips. She didn’t want to use the layoff to excuse her performance. Vincent Kamani didn’t envision winning. “I didn’t think it was possible,” he said, minutes after he had done just that – running 17:26 to win the sophomore boys’ race in 17:26, eight seconds ahead of Gonzaga’s Patrick Donnelly. His pre-race routine reflected his doubt. Once he got a half-mile into the race, though, his breathing helped calm him down, and in the second loop around the course, he moved into first place for his first cross country win. Would that confidence change his mental approach? “I don’t know, I’ll have to see next time,” he said. 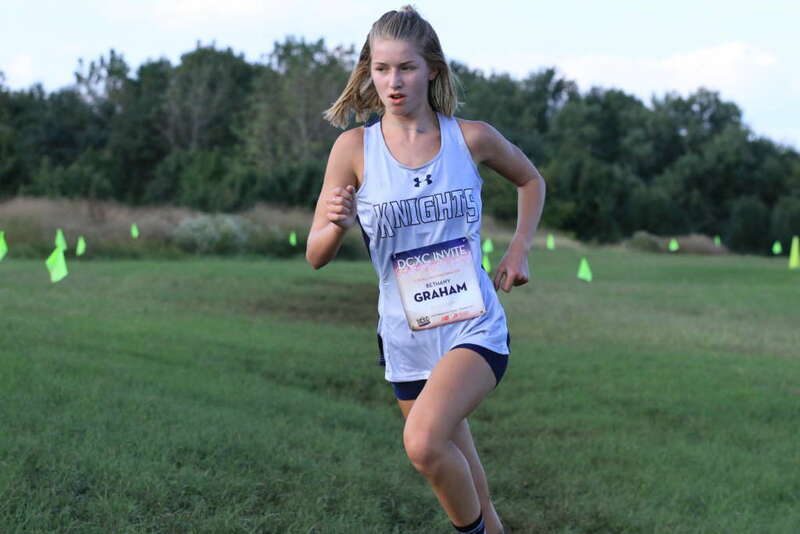 Bethany Graham took off in the junior girls’ race and put the “champ” in John Champe High School. 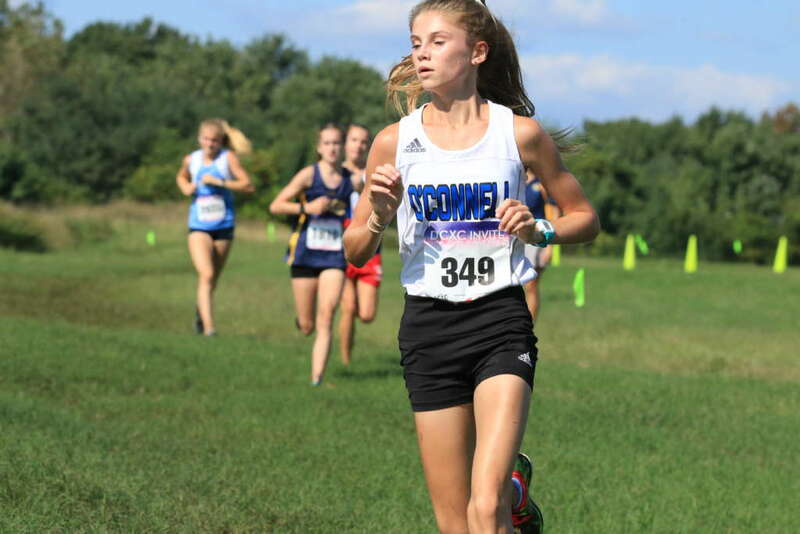 He 19:01 was the fastest girls’ time of the day and her 74-second margin over Broad Run’s Ellie Desmond was also the largest victory of the afternoon. Behind her, Ellie Desmond from Broad Run and Jenna Goldberg from Walter Johnson were struggling in the mud. Goldberg concurred. Despite the mud, her Wildcats won the girls’ overall title. Daniel O’Brien was an unknown to many local runners, heading into DCXC. He runs for Virginia Episcopal School – in Lynchburg, not Alexandria – and came up here with just one teammate. But by the time the day was over, his 16:07 junior boys’ race-winning time was the high-water mark for men. 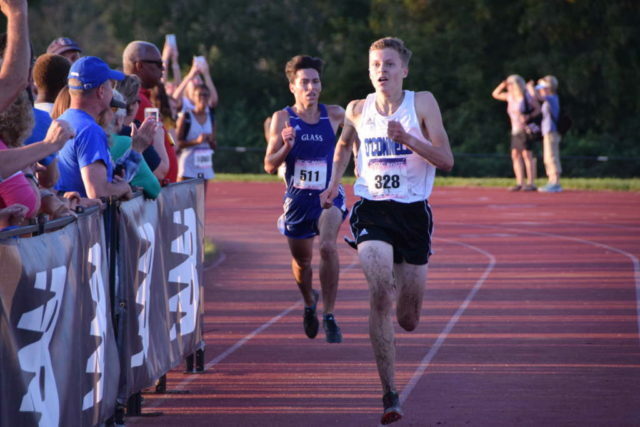 He threw in a few surges at the mile and a more decisive move after two miles to put a gap on Washington Latin’s Luke Tewalt, who was second as a sophomore. Tewalt ran a personal best time for his cross country career, despite the mud. While in pursuit, he watched how O’Brien handled the turns and ultimately approached them by slowing down to avoid losing his footing. “I didn’t want to slip, but slowing down on turns killed my mojo,” Tewalt said. Zachary Sturm was the oldest of the Grafton runners to finish in the top three of the class races, running what he called the race of his life for a 25-second personal record. 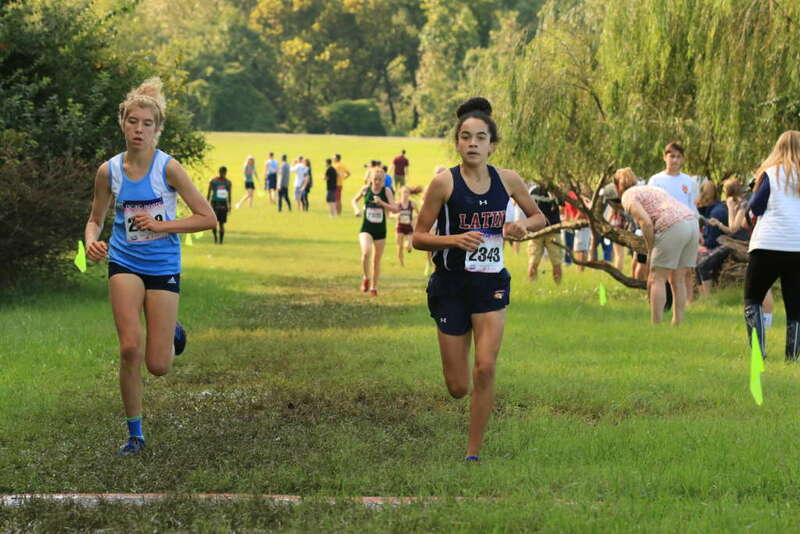 If Daniel O’Brien thought the course was messed up when he raced, it was only worse a few minutes later, when Washington-Lee’s Eva Smith-Perry was surging along in brand new spikes. Smith-Perry finished third as a junior last year. “It got hard after the second mile, and the time wasn’t what I wanted to run, but winning makes up for that,” she said. Laura Webb, who finished second as a junior, did the same as a senior. She stood out as the only top-tier runner in any of the races to have taped her shoes, covering the laces and adding an extra measure of security to her spikes. “There were a few times I hit mud and felt like my spike was about to come off, the heel moved a little but the spikes felt secure,” she said. Webb took the race out hard, leading throughout the first mile. She tried to take the high ground to avoid the mud, but soon relented. Nandini Satsangi, who finished third, dealt with it a little more, slipping and falling in the last half mile and taking her out of contention for second place. 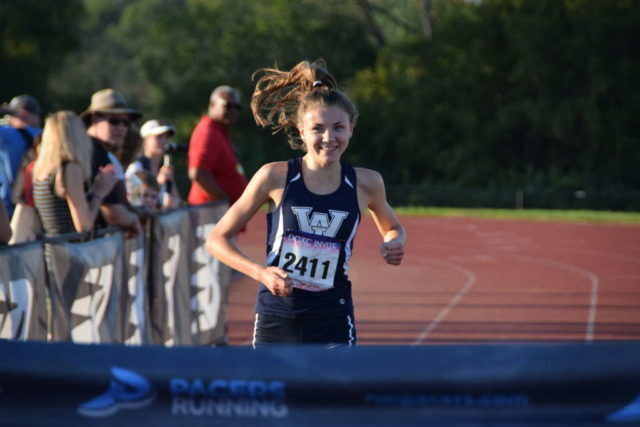 As a second-place finisher as a freshman and sophomore and the winner of the junior race in 2017, she has finished in the top three each year of her high school career. DCXC was her first invitational of the year, after Oatlands was cancelled. Bishop O’Connell’s Max Greczyn and E.C. Glass’ Theo Woods saved the best show for last. The pair came surging onto the track, even with the awkward turn with roughly 150 meters to go and brought the crowd alive as Greczyn pulled away for a two-second lead and a 16:16 victory. He repeated as his class’ champion after winning the 2017 junior race in a breakout performance in his first season in the sport. The experienced he has gained over the last year his done little to dull his enthusiasm. He wanted to repeat, but knew that regardless of how fit he was, the course was a wild card. Woods has run 1:52 for the 800 meters and was eyeing the last bit on the track to help him kick for the win, but after almost three miles of stabilizing himself in the mud, his’ kick was neutralized. Though it was muddy, John Riker (third in 16:34) had seen worse, just this week. At a dual meet Tuesday, he ran 20:00. 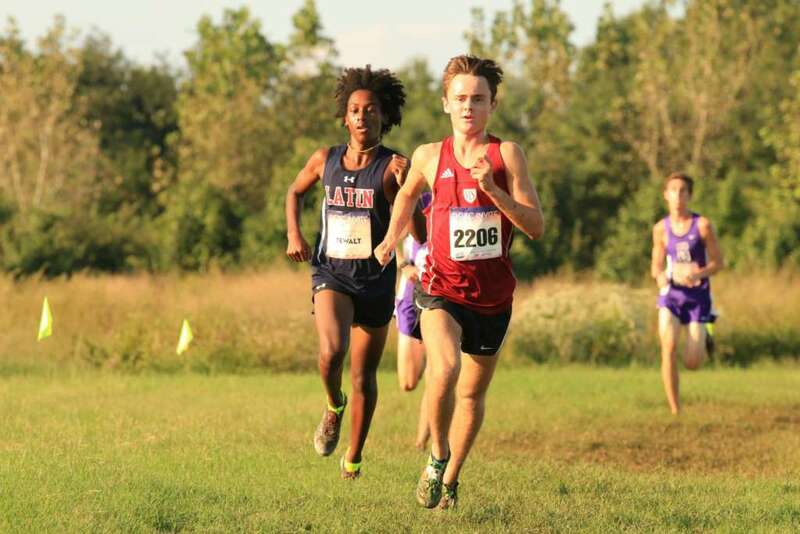 As one of four meets within 11 days, the course at DCXC “added a fun challenge,” he said. “I saw those guys move up ahead of me, so I tried my best to close the gap. He was most thrilled with his team’s overall win.